vehement or violent denunciation, censure, or reproach. an insulting or abusive word or expression. Reason #432 that life was better in the time of Shakespeare than today: instead of naughty curse words (like @#$% or &@%#$* or whatever you kids are saying nowadays), people used to use invective to curse out their enemies. 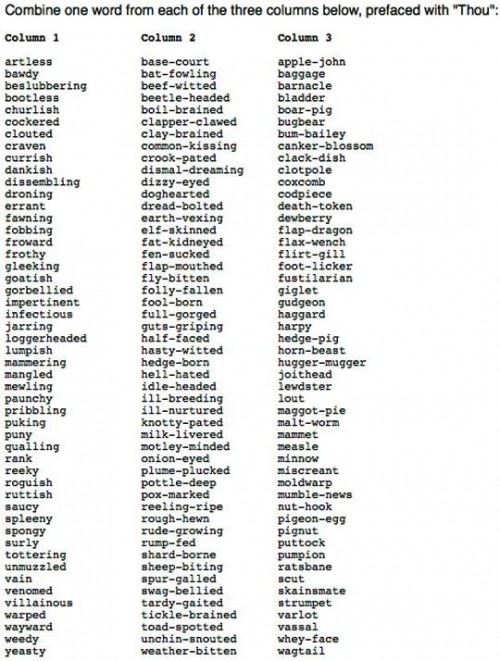 Neatorama, one of my favorite blogs, recently shared a cheat sheet on how to blast someone, Shakespeare-style. Feel free to create your own epic invective and refer to your friends as such for the rest of the day, and post your favorite combination in the comments. I'm a huge fan of loggerheaded beef-witted strumpet, for what it's worth. 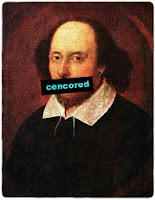 Labels: British Literature, Contest, Hilarity, Shakespeare, TAPA, What do you think?